History of the Karabakh music has always occupied an important place in the history of Azerbaijani culture and stood out by its antiquity and originality. Since ancient times, music was widely used in public celebrations and spiritual processions in Karabakh. The ashig genre, one of the symbols of Azerbaijani music, is distinguished by its antiquity in the history of Karabakh music, as the region was home for many famous Azerbaijani ashigs. Many competitions were held in Karabakh between Azerbaijani ashigs – each of them wanted to show his skills and learn more about the ashig genre. Ashig Valeh was one of the prominent singers of this genre in Karabakh, who sang such beautiful pieces of the music art as Garabagh Shikestesi, Kesme Shikeste, Bash Saritel, Orta Saritel and many others. The songs written and performed by such ashigs as Ashig Mohammed, Ashig Aziz, Molla Juma, Ashig Hussein, Ashig Ali, Ashig Alaskar and others had a positive impact on the development of the Garabagh ashig art. Ashig Peri, the first professional woman-ashig, was also from Karabakh. Starting from the first half of the 19th century, the performing arts rapidly evolved in Karabakh, especially in the heart of the region – the city of Shusha. Compared to other cities of Azerbaijan, Shusha had far more musicians, singers and dancers. In 1870-1880s, various musical meetings, clubs and schools were opened in Shusha. Eminent Azerbaijani singers Kharrat Gulu and Molla Ibrahim were the creators of the music school in Shusha. Later, the famous singer Haji Husu and musicologist Mir Mohsun Navvab created the Society of Musicologists in the city. Since then, groups of singers were performing songs in intervals between theatre performances, and in the early 20th century they started giving independent concerts on stages. 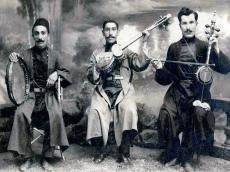 The first Orient concert took place in Azerbaijan in the summer of 1901. Lead by the prominent Azerbaijani playwright Abdurrahim bey Hagverdiyev, the concert included performances of such famous song masters as Jabbar Garyagdioglu, Meshedi Dadash, Kechechioglu Mahammad, tar players Sadikhjan, Agha Bagdaguloglu, Meshedi Zeynal, ashigs Najafgulu, Abbasgulu, and many other singers. Since those times, music could be heard from everywhere in Shusha, thus amazing many foreign visitors of the city. That is why they called Shusha “the Conservatory of the Caucasus.” The city was full of talents, which were former students of literary and musical clubs and the Karabakh school of singing. In the late 19th – early 20th century Karabagh gifted Azerbaijan with the most prominent composer of the country, founder of the first opera in the East, the great playwright, author of the first libretto, creator of the genre of musical comedy, and the author of the Azerbaijani anthem – Uzeyir Hajibayli. He composed dozens of beautiful operas which today continue to be staged in Azerbaijan and other countries – “Leyli and Majnun,” “Arshin mal alan,” “Koroghlu,” “Rustam and Zohrab,” “Shah Abbas and Khurshud Banu,” “Asli and Kerem” and many other majestic works. Another famous Azerbaijani musician, Bulbul, was also born in Karabakh. He was a prominent opera tenor, folk music performer and one of the founders of vocal arts in Azerbaijan. In his songs, Bulbul was able to blend national manners of performance with traditions of Italian vocal school. Throughout his life, Bulbul was the vocal performer and the co-author of a number of songs and romances. Today we can safely say that Karabakh, and Shusha particularly, gave Azerbaijan much more musical talents than any other region of the country. Shusha is the birthplace of musicologist Mir Mohsun Navvab, singers Kharrat Gulu, Meshedi Isi, Jabbar Garyagdioglu, Haji Husu, Sadikhjan, Seyid Shushinski, Kechechioglu Mahammad, composers Uzeyir, Zulfugar and Soltan Hajibeylis, and of many other musicians, names of which were wrote down in the treasury of Azerbaijani music for ever.